The goal of industrial biotechnology is to develop new techniques and technologies to transform renewable raw materials into chemicals, materials, and fuels by the substitution of fossil fuels. With the increase in the world’s population and the resultant growing energy demand, the need for more energy can be successfully met with the advancements in industrial biotechnology. Currently across the globe significant research has been undertaken in the production of cleaner fuels, materials, and semi-synthetic chemicals, with environmental benefits. Developing countries have huge agricultural resources that could be utilized for production of value-added by-products for the sustainable development of bio-based economy. The book comprises of chapter on the production of exopolysaccharides from halophilic microorganisms, a polymer that is normally very useful in various production sectors of the food, pharmaceutical, and petroleum industries. 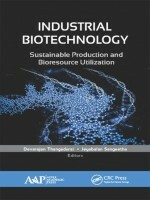 Also covered in the book are the environmental aspects of industrial biotechnology such as the genetic enhancement for biofuel production, the production of biodegradable thermoplastics, advancements in the synthesis of bio-oil, eco-friendly treatment of agro-based lignocelluloses, and anaerobic bio reactors for hydrocarbon remediation. The international roster of chapter authors have been chosen for their renowned expertise and contribution to the various fields of industrial biotechnology. This book is suitable to chemists, biotechnologists from research institutes, academia, and students as well as for industry professionals.